At CES 2018, Google was kind enough to give us a walkthrough of their newest Assistant-powered effort, the Lenovo Smart Display. It is worth noting the JBL and LG smart displays were on display as well, but our time was spent looking at the Lenovo model. Google is positioning these smart display devices in a way that they shouldn’t be compared with a standard computing device like a tablet or laptop. Sure, there’s a touchscreen, but these devices aren’t meant to take the place of productivity machines: they are made to supplement them. Thinking through the use cases for Google Assistant in your home, it becomes pretty clear that there are a handful of use cases that would greatly benefit from having a display. Weather, recipe instructions, video calls, basic knowledge questions, maps…the list goes on. And this is Google’s thinking. Deliver devices that help users get the most out of Google Assistant as possible. So let’s talk about what these things can do. The display that is always on can act as a photo frame leveraging Google Photos while giving you the time and current weather at a glance. The screen on the Lenovo looks fantastic, too, so having this on a counter or shelf would really go well with most interiors. Additionally, the light wood back and white frame make a classy, simple aesthetic that I really liked a lot. Once touched, the screen goes to what Google calls the home state. This is similar to Google Now if you remember that feature on Android phones from a few years ago. Here, you’ll see some appointments, home integrations, weather, etc. Based on your day, you’ll have different stuff showing up here. Google will be rolling out Routines later this month which will allow you to roll up a bunch of daily tasks that you can get to quickly by saying a set keyword. For the demo, they used “Good morning” as the phrase. By simply saying this, the Assistant turned on a light, gave an agenda, traffic update, and then turned on YouTube top news. You can imagine having this in your kitchen or bedroom and using it in this way on a daily basis to kickstart your morning. Similar to what you’d do on a phone or smart speaker, you can ask about businesses nearby. With the smart display, however, you also get some visual data with your query. Asking a speaker, you get the best result and have to ask to get more options. With the screen available, you can simply scroll through the other options as well. Clicking on any of them brings up something similar to what you’d see in a Google Maps listing with hours, pics, reviews, and directions. Clicking the map from here allows you to see a visual map with directions right from the screen in front of you. For now, this is only working with Nest cameras, but we’ll likely see more. 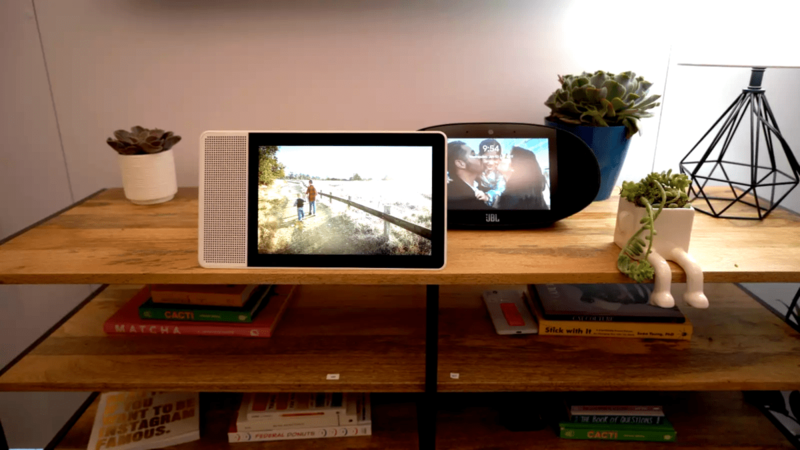 With Nest cameras in your home, you can ask Google Assistant to see your connected cameras and pull up those live feeds right there on the smart display. Again, not that you can’t do this from your phone, but having a device that is there, ready, and right in front of you is really handy. Smart assistants are really great at helping you find recipes and actually make them. Step by step The upside with these smart displays is that you have a visual list in front of you as you go. If you’ve ever gone through a multi-step recipe with just a smart speaker, it becomes easy to lose your place. Seeing the steps written out on a screen is very helpful. Additionally, if you come across a cooking maneuver you aren’t familiar with, you can simply ask Google how to do it and see a quick YouTube video. In the walkthrough, we came across a process involving rosemary that most people wouldn’t know anything about. A quick ask to Google Assistant and we had a video come up on the screen explaining the process. And no one touched anything. It becomes easy to see why these smart displays will be very at home in the kitchen. One of the things Google is best at is answering questions. From computations to landmarks to sports trivia to shopping, Google has knowledge in spades. If you’ve ever compared asking Google Assistant about a particular subject on your phone versus a smart speaker, you already know the benefit of having a screen involved. Not only can Google answer you, the Assistant can bring up relative cards and other info for you to visually consume as well. This is one of the major benefits to adding a screen to the existing Google Home experience. Out of the gate, most of the services available to users will obviously be Google-driven. And one of the best of these is Google Photos. On your phone, tablet, or desktop, you likely already know how awesome Google Photos is. Arguably the best feature is Google’s machine learning that allows Google Photos to search your personal pics for people, places, and things. And it is shockingly good at it. This type of search and show is right at home on a smart display. Especially with the 10-inch model we were demoing, being able to ask Google to pull up photos from a vacation and see them on a big, beautiful screen within seconds was a very natural and well-done. It was one of my favorite parts of the demo. Right now, Google Duo is at the center of the video calling experience. Google says more services will come with time, but right now we are only able to utilize Duo. One cool feature here is the fact that Duo is opening up to multi-device support. Being able to free up Duo from the single-device prison it is currently in will be a great move and will likely speed adoption. So, when you make Duo calls from your Google Home smart display, the recipient of the call will see your phone number and know it is you, just like if you were calling from your primary device. It is also worth noting that phone calls work just as they do on a standard Google Home. Also worth a mention is the fact that there is a physical cover that can slide over the camera if you are concerned with additional privacy. While there aren’t a ton of games made for this platform yet, the one we demoed showed a very clear, very compelling vision of what games for smart displays could look like. If you’ve played I’m Feeling Lucky – Google Home’s trivia game – you know the basics. It is a question/answer trivia setup. Immediately upon starting, you see the benefit of the screen. Colorful graphics simply add to the overall experience, even though the gameplay is exactly the same. This game was, perhaps, the clearest example of how a great screen can really enhance an existing Google Home experience. We saw not long ago the cool stuff that developers are coming up with around voice assistants. This newest dimension will only continue to spur on those efforts. I can’t fully imagine what types of things will be available a year from now that will fully take advantage of smart displays, but I’m pretty excited for it. As long as the pricing doesn’t get too out of control with these units, I can easily see this being the next step in the entire connected home experience.